Tyrosine is an amino acid and it is needed for brain function. It is also involved in the production of dopamine and norepinephrine. Both these are major neurotransmitters and are produced in the brain and adrenal medulla. Tyrosine is produced in the body by another amino acid called phenylalanine. Tyrosine is essential for the manufacture of neurotransmitters or brain chemicals that help in transmitting signals. The full name of tyrosine is tyrosine hydroxylase or TH. It has a great impact on movement and various metabolic processes and functions. It acts as a precursor of adrenalin as well as neurotransmitters as mentioned above, especially norepinephrine and dopamine. Both these greatly influence mood and behaviours, and also stimulate functions in the nervous system and metabolic processes. Tyrosine is a nonessential amino acid. This means that your body can make this amino acid on its own. But it can make it only if the necessary components are available. For the manufacture of tyrosine, one essential component needed is nitrogen. Nitrogen forms the backbone fragment of amine groups of amino acids. Nonessential amino acids can be often derived from carbohydrates or fats. Protein cannot be developed without amino acid. So, amino acids are the building blocks of protein synthesis. Tyrosine is classified as the nonessential amino acid and it is made from phenylalanine, which is also an amino acid. Tyrosine is essential for the production of brain chemicals called neurotransmitters. These influence mood and also support communication between nerve cells. Tyrosine also influences the manufacture and secretion of adrenal hormones, as well as hormones secreted by pituitary and thyroid glands. It is also a vital component in the structure of most of the proteins present in the body. If your body cannot utilize phenylalanine, a condition called phenylketonuria or PKU may occur. This can lead to mental disabilities and damage to the brain in some people. Tyrosine also influences the stress response to neurotransmitters norepinephrine and epinephrine. Some studies have been attempted to see whether stress can cause deficiency of tyrosine. Small studies on human beings and animals have suggested that taking tyrosine supplements can reduce lack of focus caused by psychological stress. But more research in this area is needed. Tyrosine is mainly used to affect mood and focus. It is used as an antidepressant also, but with mixed results. It is required for the production of enzymes and muscle tissues, as well as in the production of proteins. Production of thyroxin by thyroid gland also needs tyrosine. It is produced in the cells through the hydroxylation of phenylalanine, an essential amino acid. About half the phenylalanine present in the body is used in the production of tyrosine. If your diet is rich in tyrosine, you need only half the phenylalanine required by the body. Tyrosine acts as a precursor in the function of L-tyrosine in regard to neurotransmitter synthesis of norepinephrine and dopamine. It is believed that when dopamine and norepinephrine are present in high levels in the brain, they act as antidepressants. Cold hands and feet have also been noted in people with low levels of tyrosine. Tyrosine is good for fighting stress and anxiety. It has the ability to alter the availability of L-tyrosine. This way it helps in influencing the production of dopamine and norepinephrine. L-tyrosine has a positive effect inducing the decline in cognitive function. The dosage needed is about 20 mg.
Not much research has been done on the efficiency of tyrosine for metal performance, focus or attention. Some say that if tyrosine is taken two hours before testing it does not significantly improve reactions to visual or aural stimulus in healthy people. But some say that tyrosine can reduce lack of focus or attention. Some people suffering from lack of sleep are seen to benefit by taking tyrosine supplements. This helps in increasing their mental alertness and focus. 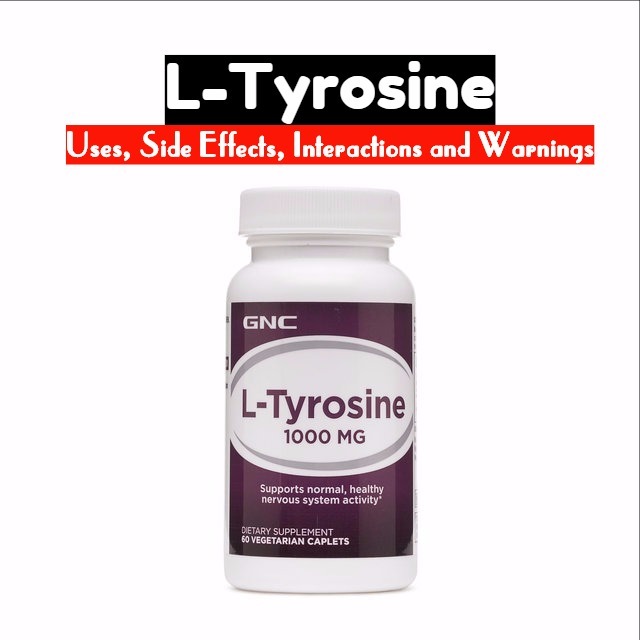 L-tyrosine should be taken with a meal high in carbohydrates, or at bed time. Tyrosine supplementation, combined with low calorie diet and exercise, can reduce body fat mass in overweight people. You get best results when it is combined with caffeine, green tea and calcium. One study suggests that L-tyrosine can influence the hunger hormones. L-dopa, which is often prescribed in the treatment of Parkinson’s disease, may interfere with the absorption of tyrosine. When tyrosine is used in combination with MAOIs, it can cause a drastic increase in blood pressure in individuals taking prescription antidepressant drugs. It can even increase the risk of heart attacks and strokes. Tyrosine is a precursor of thyroid hormone. So, it may increase levels beyond normal when combined with synthetic thyroid hormone drugs.